We interrupt these fascinating and invigorating blog posts to bring you dessert fresh from the orchard! A neighbor came by this morning with a bucket of little golf-ball sized cling-stone peaches. 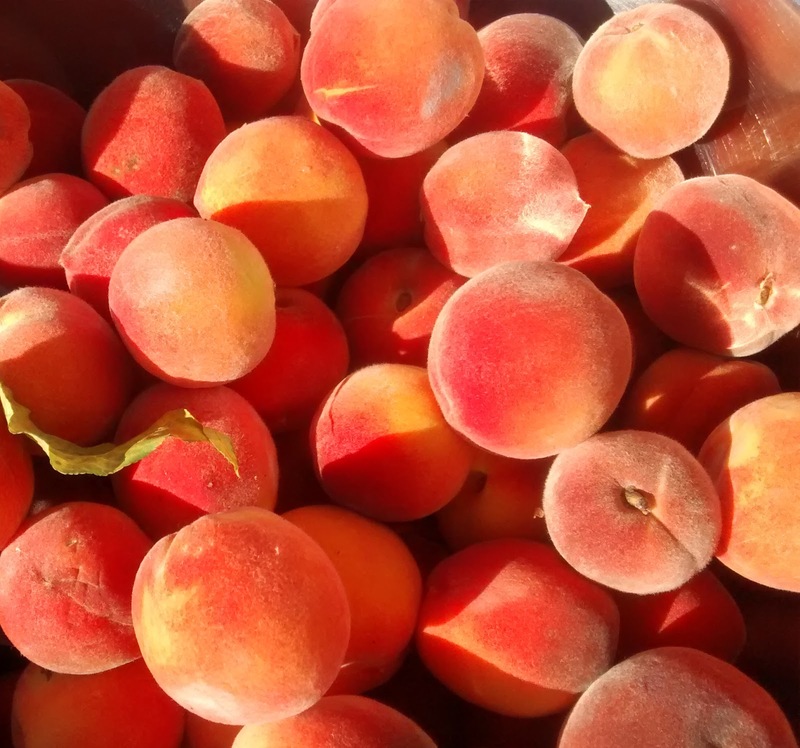 This neighbor grew her peach trees herself, from pits planted one year (next time you eat a peach, plant the pit in the yard and check next spring and see what happens!). I thought I would maybe try my hand at some fried pies later on after dinner, but time got away from me to make pie dough and since I believe in processing fruit as soon as possible, I decided to just slice and freeze them for pies later. But the idea of crisp little peach hand pies wouldn't leave me, and though I knew I didn't have time to make a pie crust from scratch, it occurred to me that the tortillas I was about to cook for dinner could do double-duty as pie dough! The result was crispy and good. 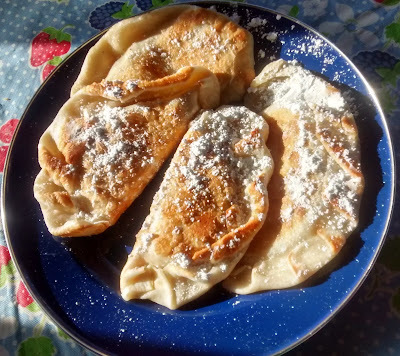 I am 99.9% sure that any dough you have on hand would work for this; from egg roll dough (for wee pies) to puff pastry, biscuit dough or some wonderful buttery dough you happened to whip up and store in the freezer for your creative gourmet moments. This recipe will warm the peaches but not cook them like a regular baked peach pie. Personally, I find a warm, ripe peach is mushy enough for me! Slice the fruit, drizzle honey over to taste, sprinkle cinnamon to taste, and put one or two big spoonfuls in each tortilla. Moisten the edges of the tortilla with a little water, fold in half. Pinch and fold the half-moon side. Fry tortilla pies until golden. Sprinkle with powdered sugar. Serve immediately. *I never feel comfortable pouring half a bottle of oil in a pan to fry. I just put 1/4 inch in a small pan and baby sit the item being fried, turning it several times. Here's an option for you: These little peaches are so little, that if I had peeled them there wouldn't be much left to eat. I didn't have time to blanch them and so I sliced them peel and all. This doesn't bother my family since I often include the apple skin, pear skin, and plum skin in my in-a-hurry big country style pies. It isn't company-style perfect pie filling I know; just lower your standards and call it "rustic country pie filling." remembering all the good nutrition that is in the skin!